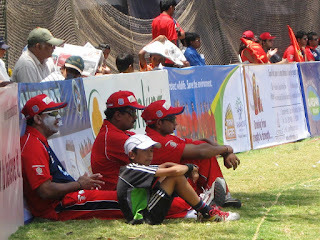 Penning my Thoughts: Bounce Padoon-ahi, Bat firavoon-hi, Ball maarun dhavaaychaaa...!!! Bounce Padoon-ahi, Bat firavoon-hi, Ball maarun dhavaaychaaa...!!! Ok, in case you were wondering what the title was all about, this melodious tune was the result of every four, six or fall of wicket in every instance of an MPL match. 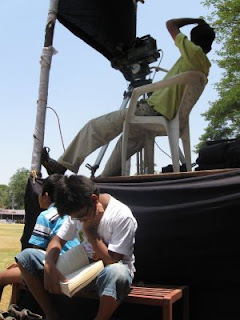 MPL is basically the Maharashtra Premier League flagged off by Sharad Pawar, which catered to an equally enthusiastic audience from around the state. 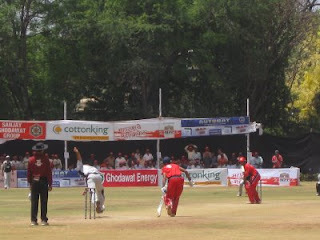 I watched the first semi-final between Torna Tigers(Red) and Sindhudurg Sailors(Blue), and though the run-rate was over 6 an over, I really couldn't keep my eyes open throughout the match. 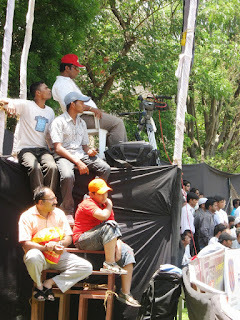 Like I said, it's for cricket enthusiasts...! Well, in case you're wondering again, who won the game, it was the Sailors, who went on to lose to Raigad in the finals. well, had it not been for an 8x zoom in my sister's digital camera, I might not have bothered to take pics of the action going on in the field out there, the crowd was a whole lot more interesting.